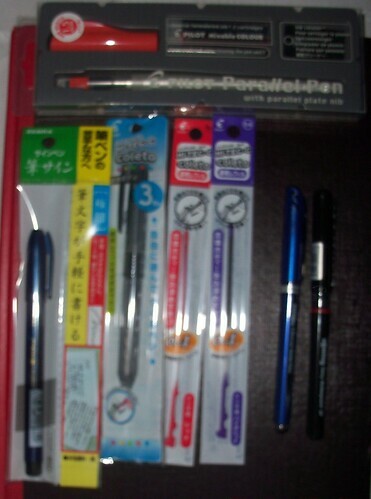 Last week I placed an order on JetPens.com and today it arrived. I ordered a 1.5mm Pilot Parallel Calligraphy pen, a Zebra super fine brush pen, a Pilot Hi-Tec-C coleto 3 color multi pen body, 2 .4mm Hi-Tec-C coleto refills in red and violet (i thought the body came with a refill, hence me now only having 2 of 3 refills), a .5mm Rotring Tikky Rollerpoint Extra Fine liquid ink pen, and a .35mm Pentel Energel Euro. Expect to see these reviewed in the coming weeks. Exciting! Can't wait to read your reviews!